Want to preserve your brain health and cognitive function? Start with healthy eating. A heart-healthy diet can help keep blood vessels clear, and regular aerobic exercise can increase the number of blood vessels in your brain, even if you don’t start until middle age. Reduced blood flow to the brain, loss of gray matter, and buildup of sticky tangles and plaques of certain proteins can all lead to loss of cognitive ability. A large body of strong evidence supports the idea that physical activity and healthy eating can help keep your brain sharp by addressing all three of these issues. As the brain ages, the number and size of its blood vessels shrink, leaving fewer alternate routes for blood to take if some vessels are narrowed or damaged by stroke. A heart-healthy diet can help keep blood vessels clear, and regular aerobic exercise can increase the number of blood vessels in your brain, even if you don’t start until middle age. In a new study, people who lead more active lifestyles had less loss of brain matter than their less active peers. In another recent study, people who were consistent with their time spent walking over 10 years showed less loss of brain matter and maintained their general cognitive performance. It didn’t matter how much these people walked, as long as they kept it up over time. Even people who carry a dominant mutation for Alzheimer’s disease and are at increased risk for developing this disease may be able to slow the accumulation of brain-clogging amyloid by getting more exercise, according to recent research. In another study, participants who were more active at the start of the study had lower levels of beta-amyloid in their blood and a lower risk of showing cognitive impairment at the end of the 13-year study. 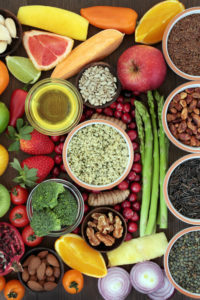 Healthy eating has a role to play as well: Epidemiologic studies have shown that the Mediterranean diet (which relies heavily on fruit, fish, vegetables, and olive oil), may increase brain volume and lower the risk of both mild cognitive decline and Alzheimer’s disease. Omega-3 fatty acids (like those found in fatty fish and walnuts), antioxidants (plant chemicals and vitamins abundant in vegetables and fruits), and certain B vitamins (B6, B12, and folate) are thought to be especially good for preserving brain health. Don’t try to increase your intake with supplements, however, because there’s no consistent evidence that nutritional supplements play a protective role. Preserving cognitive function is essential but keeping your vision sharp is important to enjoying your golden years, too. Age-related macular degeneration (AMD) is one of the leading causes of blindness in the United States. Healthy eating is crucial to preventing AMD. Vitamins C and E, beta-carotene, zinc, and the plant compounds lutein and zeaxanthin are important weapons in the fight against blindness. Experts also recommend you eat fish at least twice a week to support eye health. To learn about ways to preserve cognitive function through a healthy lifestyle, purchase Eat Well and Exercise from www.UniversityHealthNews.com. aerobic exercise, age related macular degeneration, alzheimer, amd, antioxidants, b vitamins, b12, beta amyloid, beta carotene, brain, brain health, brain volume, causes of blindness, cognitive decline, cognitive function, cognitive impairment, cognitive performance, diet, exercise, eye health, folate, health, healthy diet, healthy eating, healthy lifestyle, heart healthy, heart healthy diet, macular degeneration, mediterranean diet, mild cognitive, nutritional supplements, omega 3, omega 3 fatty acids, physical activity, stroke, supplements, the mediterranean diet, vegetables, vitamins, walnuts, zeaxanthin, zinc.